Jonesboro is located at 33°31′28″N 84°21′15″W﻿ / ﻿33.52444°N 84.35417°W﻿ / 33.52444; -84.35417 (33.524512, -84.354290). 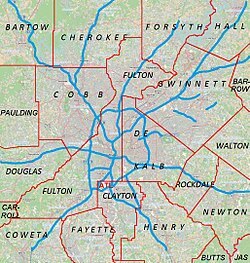 According to the United States Census Bureau, the city has a total area of 2.6 square miles (6.7 km2), of which 2.6 square miles (6.7 km2) is land and 0.1 square miles (0.26 km2) (1.89%) is water. MARTA and Xpress GA/Georgia RTA buses serve the city. As of the census of 2000, there were 3,829 people, 1,466 households, and 1,023 families residing in the city. The population density was 1,477.4 people per square mile (570.8/km²). There were 1,561 housing units at an average density of 602.3 per square mile (232.7/km²). The racial composition of the city was 72.79% African American, 20.63% White, 0.21% Native American, 0.73% Asian, 0.31% Pacific Islander, 3.45% from other races, and 1.88% from two or more races. Hispanic or Latino of any race were 7.55% of the population. In the past 2 years that population has doubled to about 15.86%. There were 1,466 households out of which 34.1% had children under the age of 18 living with them, 38.6% were married couples living together, 25.6% had a female householder with no husband present, and 30.2% were non-families. 25.5% of all households were made up of individuals and 11.5% had someone living alone who was 65 years of age or older. The average household size was 2.60 and the average family size was 3.09. In the city, the population was spread out with 29.2% under the age of 18, 9.6% from 18 to 24, 29.6% from 25 to 44, 19.2% from 45 to 64, and 12.4% who were 65 years of age or older. The median age was 32 years. For every 100 females, there were 84.1 males. For every 100 females age 18 and over, there were 78.1 males. The median income for a household in the city was $31,951, and the median income for a family was $39,143. Males had a median income of $29,236 versus $25,797 for females. The per capita income for the city was $16,178. About 19.2% of families and 20.2% of the population were below the poverty line, including 33.9% of those under age 18 and 19.7% of those age 65 or over. Jonesboro was founded as Leaksville in 1823. In 1846, the Macon and Western Railroad arrived into the area and the town was renamed in honor of railroad official Samuel G. Jones. Jonesboro was incorporated in 1859. Dr. Robert W. McCullough, Optometrist, former state association and Board President. Lynyrd Skynyrd's (pronounced 'lĕh-'nérd 'skin-'nérd) album cover was photographed near the corner of Mill and Main streets. ^ Hellmann, Paul T. (May 13, 2013). "Historical Gazetteer of the United States". Routledge. p. 234. Retrieved 30 November 2013. ^ "City History." (Archive) City of Jonesboro. Retrieved on September 21, 2012.